A GRIP ON SPORTS • Another college football Saturday awaits. But if you want to watch it all, you better be ready to give it about 18, 19 hours. Wait, that’s typical, isn’t it? Read on. • Those of you who have just one team you root for, you are so lucky. The four or five hours you have to devote to your Saturday – or 10 if you drive to Pullman – makes it so much easier. But if you are a generic fan, have one team you follow above all else but enjoy watching college football just, well just because it’s such a fun sport to watch, then the day begins around 7 a.m. and ends somewhere the other side of midnight – sometimes. You also missed Lee Corso’s pick and, I’m guessing here because I was running down links and writing this column, his tribute to buddy and fellow Florida State football player Burt Reynolds. ESPN, ESPN2, ESPNNews, ESPNU, ESPN3, ESPN+, ESPN Ocho. Fox, FoxSports1, FoxSports2 (as if anyone can find that one). CBS, CBS Sports Network. ABC, NBC – better known as the Notre Dame Network. All the conferences’ networks, from the Pac-12 to the SEC and in-between. The local station, SWX, even has games. Press the C button on your Comcast remote – I’m sure there is something similar with Dish and DirecTV – and there are so many college football games listed even a 68-inch screen isn’t big enough to hold them all. And it isn’t just the morning or the afternoon. There are games all night. Case in point, Washington State is hosting San Jose State tonight on the Pac-12 Network. The game is slated to start at 8, but with the pregame events centered round the Hilinskis, their foundation and Tyler’s legacy, the guess here is the kick will come somewhat later than that. By the time each team is done throwing their 80 passes or so, it could be next month in Boston. Heck, it may well be tomorrow here. That would be Sunday morning. And you know what Sundays mean, right? The NFL. I, for one, am not ready. 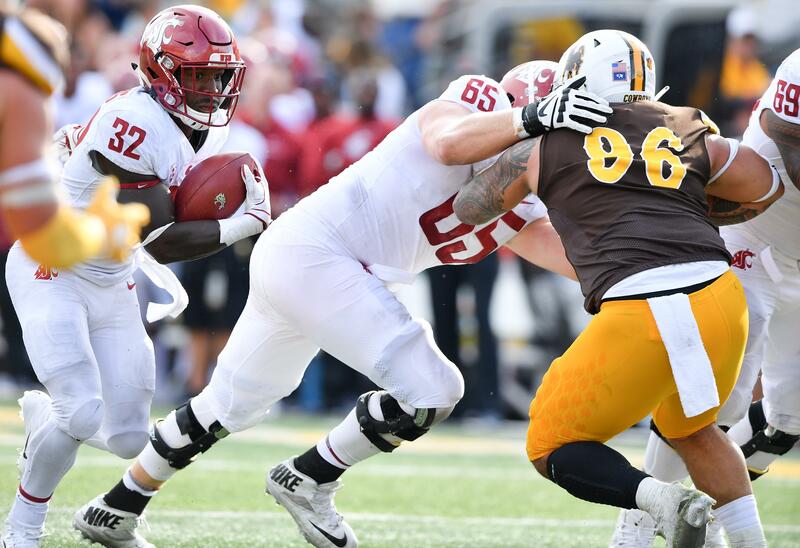 WSU: It always makes me a bit wary when everyone believes a game will be a blowout. Oh, it should be, as Washington State is favored by more than 30 points. But expected big blowouts sometimes don’t materialize late at night. We’ll see. Theo has a preview of tonight’s game, the keys to said contest, his pick – WSU in a rout – and, as we linked above, a story on the GameDay piece. … We delved into the new-look offensive line this week for The Athletic. It takes a subscription, but for my stuff, it must be worth it, right? … CougCenter’s Jeff Nusser, a high school teacher and former News Tribune editor, has a piece this week on how Washington State is dealing with Tyler Hilinski’s death. … The Seattle Times has a preview of tonight’s game, which should be a long one. … San Jose State is coming off a loss to an FCS school, UC Davis. Elsewhere in the Pac-12, Washington wants to shake off the loss to Auburn and move forward against North Dakota. … Oregon State is still not saying who will play quarterback against Southern Utah. … Oregon’s game with Portland State is more of a scrimmage. … Former Gonzaga Prep standout Evan Weaver is making his mark at California. … Stanford’s defense will be tested but the offense has some puzzles for USC as well. … Colorado and Nebraska is an old rivalry reborn. … Utah is on the road at Northern Illinois. … USC’s battle with Stanford could go a long way to deciding the North and South race. … UCLA is in it deep today with an Oklahoma team that has playoff aspirations. … Michigan State is the latest Big Ten team to travel to Arizona State in September. … Arizona doesn’t want to be 0-2 after today’s road game at Houston. Gonzaga: The volleyball team picked up its first win of the season. … The men’s soccer team couldn’t score against 17th-ranked UC Davis. 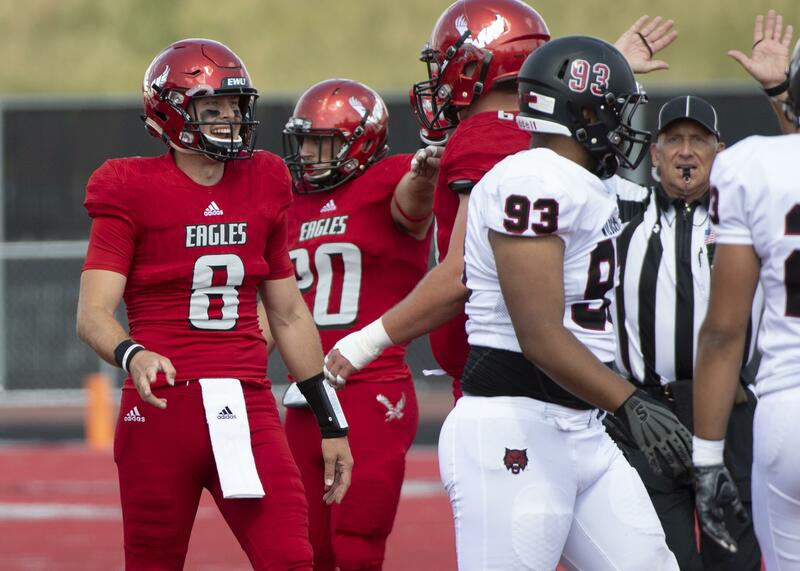 EWU: The Eagles are playing Big Sky opponent Northern Arizona today in Flagstaff. It is not a conference game. But it will bear heavily, no doubt, come NCAA playoff selection time. Ryan Collingwood is in Flagstaff and has this preview. … Ryan also picks all the Big Sky games today. … Larry Weir is in Flagstaff as well, to broadcast the contest. But before he left, he posted a Press Box pod with Eastern and WSU interest. … The volleyball team picked up another win. … So did the soccer team. … Around the Big Sky, every FCS school has to decide how many money games they will play against FBS competition. … There are some of those today, most notably in Eugene, where Portland State hopes to stay healthy. … Montana has a game against Drake, which hasn’t played a full game yet. … Northern Colorado has another game against another tough FCS foe. … So does Montana State, which hopes to hand South Dakota State a home loss. … Even with a star quarterback, Idaho State doesn’t draw well. … Cal Poly has to replace its quarterback for the Mustangs’ home opener against Weber State. … UC Davis faces USD. Idaho: The Vandals hope to get back on the winning track today when they host Western New Mexico. Peter Harriman has a preview of the first Kibbie Dome game in many years in which UI is an FCS school. Indians: Spokane is going to the Northwest League finals, with “going” being the key term. As always, the Spokane Interstate Fair takes precedence, meaning the Indians, who defeated Everett 5-4 yesterday, will face Eugene in Oregon for a best-of-five series. Dan Thompson has the story. Preps: It was your typical Friday night in prep sports, with lots of football games and a smattering of other sports. … The best game of the night may have been at Post Falls, where visiting University and the Trojans battled it out, with the Titans finally winning 43-37. Jim Meehan has the game story and Bruce Twitchell the photos. … Mead hosted Coeur d’Alene is Cheney and it was the visitors who seemed most at home on Roos Field’s red turf early. John Blanchette has the story of the Viks’ win and the Panthers’ second-half comeback. Libby Kamrowski has the photo report. … Lewis and Clark dominated Davis 34-8. Steve Christilaw was at Albi for that game. … We also can offer a football roundup and one from play in soccer. … There is an important cross country invitational today. Golf: Reid Hatley won another tournament this week. Mariners: With football in full swing, it is easy to put the M’s ultimately disappointing season behind us already. Yet they have games to play. Less than two dozen of them and they face a 6.5-game deficit after a 4-0 loss to the Yankees last night. … Marco Gonzales is headed back to the active roster. Seahawks: The real question for Sunday's season opener is whether Earl Thomas will start. Pete Carroll isn’t saying but the Broncos are probably preparing for him. … The thrust of the SI piece – we linked it yesterday – was denied by everyone still in Seattle. But others had opinions. … Shaquem Griffin is ready. Published: Sept. 8, 2018, 9:23 a.m.